Coffee culture. Notice the coffee/tea pairing. Vietnam is the third largest producer of coffee in the world. But when it comes to producing Robusta variety beans they’re number one. Trung Nguyen, the country’s biggest coffee company, has done a “Jollibee” in that even the Nescafe brand falls behind retail sales nationwide. 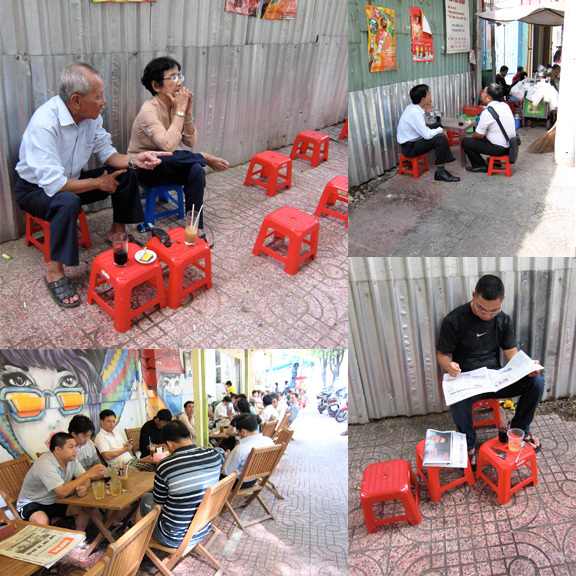 There is not a single Starbucks outlet in Ho Chi Minh; in place are Highlands Coffee houses. And they do an excellent job. Coffee drinking in Ho Chi Minh alone is like a religion. You get sidewalk cafes, more grassroots operations with low plastic tables and stools and of course posh hotel lobbies filled with coffee drinkers. The thing I like about Vietnam is that wherever you go, you’re sure to have a good brew. In my short visit I found some cups marginally better than others but definitely none disappointing. 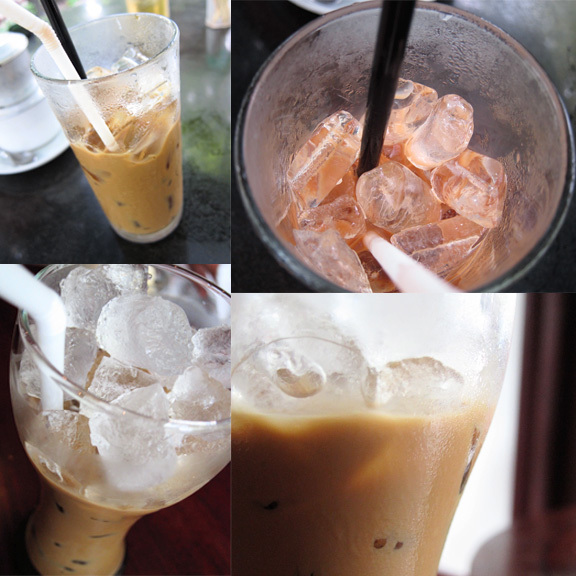 Like Franco before me, I had gotten addicted to the ca phe sua da, or the iced milk coffee. Which is just basically extra strong, drip-filtered coffee using dark roasted beans mixed with condensed milk over ice. It’s incredibly robust, creamy and refreshing and actually tastes like mocha. More chocolate than coffee; with that beautiful caramel color. Ca phe sua da; Vietnamese Iced Milk Coffee. But I also love the ca phe sua nong, or the hot milk coffee. Which essentially consists of the same strong coffee and condensed milk. This infusion has balls. The coffee is full-flavored and almost gritty as its allowed to drip for quite some time. (The longer the contact time with hot water the higher the caffeine content.) It’s so dark that the coffee just turns a deep chocolatey brown with the addition of milk. The milk also gives it this viscosity that actually coats the back of a teaspoon. You get this extremely smoky, rich, earthy aroma and a really pronounced round buttery finish with each sip. Yes, you really taste the butter. This is a black coffee drinkers’ brown coffee. Ca phe sua nong. 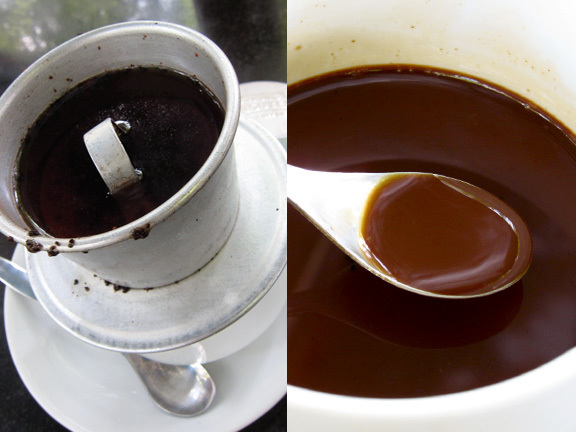 Vietnamese style coffee filter on left. And what you get after the drip process on right. Dark, smooth and buttery. Coffee is a hot beverage. Hot in the sense that it heats the body; so a glass of iced Jasmine tea, which is cooling, is served as a chaser alongside every coffee order to balance things out. It doesn’t really help to balance out caffeine levels much, though. In one morning I think I had two iced coffees and was wired and palpitating the rest of the afternoon. But the taste will get you. It got me. And now I love it. Long time. For a recipe on how to make caphe sue da, click here. This looks wonderful! I love how this looks like,thanks for sharing the recipe,I cant wait to try this soon. cafe sua da the best! i even brought home those filters they place over the cup, in an attempt to replicate it every morning. haha. @GUS how did your home version turn out? I guess the beans make a big difference. I'm kicking myself in the head for forgetting to get one of those filters. It actually comes free with a bag of grounds (of Trung Nguyen) in the groceries.